BookLust: Review-itas: The difficulties of transitioning to high school and my first Toni Morrison! Review-itas: The difficulties of transitioning to high school and my first Toni Morrison! 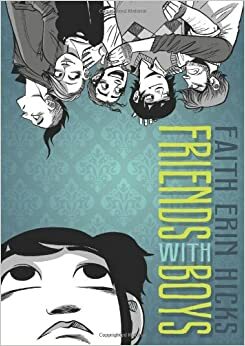 I found Faith Erin Hicks' Friends with Boys at the library and picked it up mainly, I admit, because of the cover. Also because it is published by First Second Books, and I really enjoy their graphic novels. It's a story about Maggie, entering her freshman year of high school after years of home schooling. Her three older brothers are already in high school, but as she sees them in a new setting, she learns a lot more about them. And she meets two new people, too, Alistair and Lucy, a brother and sister team who do everything together. It's a sweet story about accepting change in your life, accepting what you can't change, forgiving others, and trying your best to be a good person. Not really new lessons, I know, but the artwork is absolutely beautiful, and the characters come to life so completely not only in their words and facial expressions, but in the ways they dress and the settings in which Hicks places them. Really enjoyed this one! 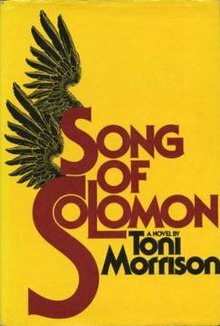 Honestly, if reading Toni Morrison's Song of Solomon taught me anything, it is that Toni Morrison probably should not be read via audiobook. The author narrated the story herself and was actually quite good. But I have never read Morrison before, and she is all about the symbolism and the slippery chronologies, and the complicated family trees, and I think it was a failure from the start. I assume it would be a lot like trying to read 100 Years of Solitude on audiobook, with characters that are all related to each other and named after each other, and a whole lot of confusion unless you can go back a few pages or to the family tree and ground yourself again. So, audiobook, maybe not the best plan. But what gorgeous language! What fantastic names that probably all were symbols for other things that went completely over my head! What dramatic plot twists! I definitely need to read more Morrison, but I need to read her in printed form. Your first MORRISON! Yayyy! Sorry it didn't jive so well on audio, but I do hope you'll pick up some of her stuff in print. She's seriously amazing. Beloved leveled me this year. Well, that's a strong recommendation! I definitely plan to read more of her, so I'll look out for Beloved! But yes, I must read more. Well, between you and Andi, you pretty much have me convinced that I should get it ASAP! I will look to see if the library has that one - I don't recall seeing it, but perhaps it will be added to the collection soon. Well, let us know what you think when you read more Toni Morrison. She's not my cup of tea at all, but I like hearing why other people like her (if they do). I have a feeling people like her for all the symbolism! It's like layers upon layers and I wish we had read her in high school because I think I miss a ton of it. Also, I think there's a lot of religious imagery that I miss. That's funny I listened to Home by Morrison not too long ago on audiobook and actually thought the audio was a plus! But it's definitely a shorter book than Song of Solomon. Good for me to keep in mind. Maybe Song of Solomon just didn't work for me, and it would work for others? There was a second narrator who literally would just say one sentence every so often, and it felt very odd to me, and it makes me wonder what it is about the way the book is set up that would inspire them to bring in a narrator for like, ten sentences in the whole book. Right! Song of Solomon on audio was not a good place to start. I think it is among her most complex, even more so than Beloved, which is big and powerful and considered by many her best. I love her voice, but need words on paper for most of her books. Try her first The Bluest Eye. A deceptively simple story that shakes up stereotypes and opens eyes to the reality of African American life. That is a book everyone needs to read. I agree with Stefani. In Home, her latest, she returns to the simplicity of The Bluest Eye--which is still my favorite. Do read it. Do you mean try The Bluest Eye on audio, if I try her on audio again? I am happy to do that, it is definitely available. Beloved, I will stick to the print version.